The International Association of Blacks in Dance (IABD) in partnership with Anthony Burrell Center for Dance, Atlanta Dance Connection, and Ballethnic Dance Company will present a weekend convening of Atlanta-based artists to learn and share together through this exciting dance program – EVOLVE | atlanta. 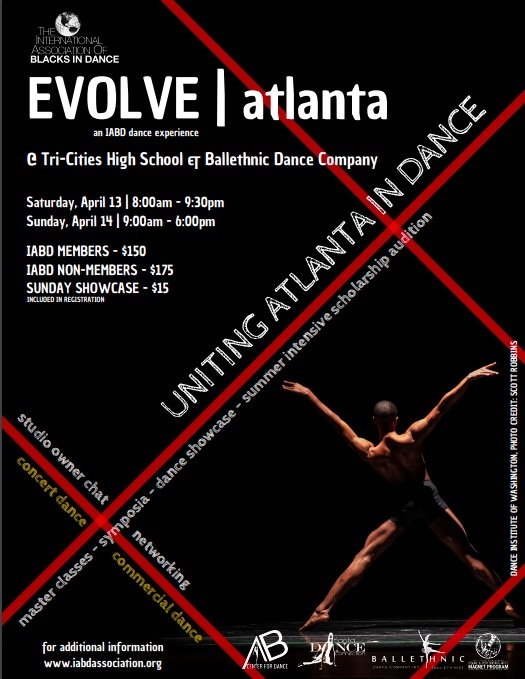 Tri-Cities High School’s Visual & Performing Arts Magnet Program lends its East Point, GA location, April 13 & 14, 2019, as dancers ages 14+ take part in a weekend of master classes, symposia, summer intensive scholarship auditions, networking reception and receive a ticket to the EVOLVE dance showcase. “It is important to unite and collaborate to share the collective resources of our community”, says Nena Gilreath of Ballethnic Dance Company. True to its mission, vision, and values, EVOLVE continues the IABD tradition of intergenerational learning aimed at maintaining the aesthetic and integrity of Black Dance in the American tapestry. Over its three decades of existence, IABD has come to represent communities of administrators, artists, dance companies and directors, educators, scholars, students and teachers.